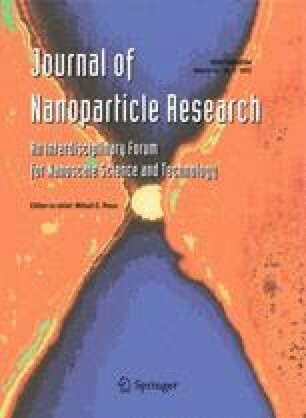 The present work demonstrated a simple method to synthesize Ag nanowires with a diameter of 60 nm and length of 5–20 μm by reduction of AgNO3 using polyvinylpyrrolidone as not only reducing agent but also capping agent in distilled water assisted with a trace amount of salts. The shape and yield of Ag nanowires significantly depended on the concentrations of these trace salts and reaction temperatures. A mechanism of dynamic dissolution and formation of Ag x A y between anion in salts and freshly formed Ag nucleus has been proposed to explain the growth of Ag nanowires. The Ag nanowires have been applied to form a transparent Ag film with a sheet resistance of 50.2 Ω/sq. and transmittance of 84 % at 550 nm. The authors are grateful to Prof. S. Isoda for helpful discussions. This work was part of the Development of Inverter Systems for Power Electronics project, supported by the New Energy and Industrial Technology Development Organization.